Full spray hand held shower head. Push button pause control for water savings and makes it easier to get soaped up when using a shower chair. The shower head grab bar mount makes it possible to have the shower head next to you or as a slide bar in front of you in the shower. Includes a tangle-free flexible stainless steel shower head line. Push button pause control for water savings and makes it easier to soap up when using a shower chair. With anti-clog nozzles to remove mineral deposits. 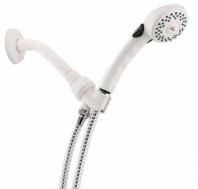 Includes shower arm mount and tangle-free flexible stainless steel shower head line.